I am currently enjoying serving as a ‘creative advisor’ to poet artist Alyson Hallett on her most recent iteration of the Migrating Stones project. 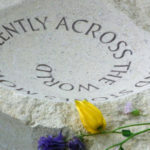 This project is one in a series in which Alyson has placed stones, with the words “… and stones moved silently across the world” carved into them, in carefully chosen sites around the world. For the fifth iteration, she is planning a participatory element which will see the stone passed from person to person. While not overtly ‘about’ human migration, the slow, unfolding beauty of this project is that it contains these resonances and invites reflection on the ways in which all things move, and the huge range of influences upon that movement. I see my work with her as similar to that of a midwife or doula to a pregnant mother; through a series of meetings, phone calls and skype sessions, I have listened deeply, asked the hard questions, strategised obstacles, reassured, encouraged and celebrated. I have drawn on my own work experiences to input on the nature of the participation and on the performative elements. Any artist needs what Julia Cameron described as “believing mirrors” to help them to bring a piece of work into the world. For me this role is always an honour and a pleasure. Here is a short video of Alyson preparing the 5th stone. Follow @migratingstones and #migratingstones on Twitter.